Sussex chief executive Rob Andrew is determined to bring silverware back to the county but wants everyone to look forward and stop reflecting on the club’s golden period. Sussex won seven trophies from 2003 to 2009 during a trophy-laden period but – apart from Division 2 of the County Championship in 2010 – have not won anything since. The club finished fourth in Division 2 of the County Championship last season and failed to get out of the T20 Blast and Royal London One-Day Cup group stages. That led to coach Mark Davis leaving the club by mutual consent, while long-serving batsman Chris Nash’s contract was terminated a year early at his request. There is a positive feeling around Hove, though, with a number of promising young players agreeing new or extended deals already this winter. Experienced players like Luke Wright and Chris Jordan have also signed new contracts and Andrew feels the club will be competing for trophies again in the not too distant future. He said: “I want nothing more than to bring silverware back to this club. 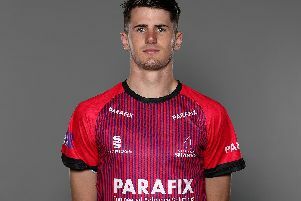 “I hate losing and I hated the fact we didn’t get out of the T20 competition by 0.3 (run-rate) on that last night against Essex. For my money, we could have easily been at Edgbaston (Finals Day) and on our day we can beat anybody. “We proved that in the 50-over, in the T20 and in the Championship on our day. Where we let ourselves down was our bad days were too bad. Andrew, who has been in his role just short of a year, wants everyone to look to the future now and stop reflecting on what the club has done in the past. He said: “There was a golden period in the early 2000s but that finished in 2009, so that’s quite a while ago now. “Arguably one of the slight issues I’ve felt is the club looks back too much to different eras and actually you’ve got to start looking forward. “That’s why we’ve extended some of our senior players contracts, like Luke Wells, Chris Jordan, Luke Wright through to 2020, plus all the young players. I just want everybody to focus on what’s coming and not keep harking back to what’s happened. Andrew says the club will take their time to make sure they appoint the right man for the vacant head coach position. Davis left Sussex last month and Andrew said: “We’re trying to make the right decision for the club. “It’s a big decision and we will try to get it right. There’s no timeline on it, it’s not as if we’re playing tomorrow.